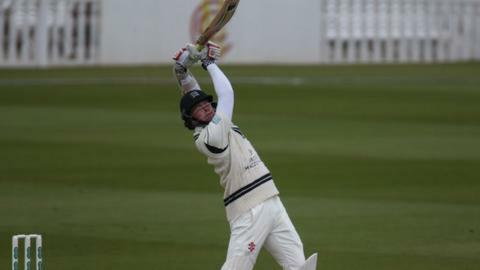 Sam Robson completed a career-best double century at Lord's to maintain Middlesex's superiority in their opening County Championship game of the season against Warwickshire. Robson added a further 56 to his overnight score to reach 231, as Middlesex moved from 317-4 to 452 all out, backed by John Simpson's 52. Warwickshire captain Ian Bell was one of two early visiting wickets to fall. But Jonathan Trott and Varun Chopra saw the Bears to 146-4 by the early close. Chopra made 57, while former England batsman Trott, who batted in old-style helmet which no longer complies with England & Wales Cricket Board regulations, was still there on 62 when play was called off for the day following a break for bad light late in the final session. England's Steven Finn got two wickets on his first competitive appearance since England's third Test against South Africa in January after the calf injury which kept him out of the World T20. He struck with his first ball when he got one to rear and take the shoulder of opener Ian Westwood's bat before removing Sam Hain cheaply. Bell was one of two victims for Tim Murtagh, bowled after only getting half forward to a delivery that may have stayed a touch low. In the morning session, Robson's highest first-class score surpassed his previous best, an unbeaten 215, also against Warwickshire, at Edgbaston in 2013. It was also the highest-ever individual score by a Middlesex batsman against Warwickshire, overtaking a mark set by Bill Edrich, who scored 225 at Edgbaston in 1947. "I probably couldn't have found a better ball first up. I didn't feel I deserved to go at four an over. But that happens when you are on the attack. "I'm where I want to be. I felt in good rhythm. This is a nice starting block. There's no magic answer apart from bowling and getting rhythm that way. "I'm the sort of bowler who likes bowling a lot. If I was only bowling 15 overs in a day in the game, I'd be bowling my overs in the nets." "At the start of the day we could have been looking at 500-550, and batting after tea. To bowl them out by lunch was a good effort. "I felt good. Jonathan Trott looked in fine order too, as he did last week. If he is in a good space, then we are a strong batting line-up. "The ball that got me stayed a little, and Belly too. Finn bowled well. That was a horrible delivery for Ian Westwood to get first up, pace and bounce. He had to play at it."